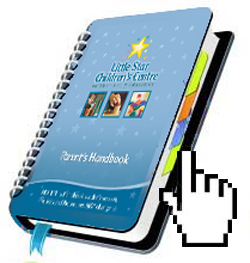 Parent Handbook - Little Star Children's Centre - Preschool and Daycare for Qualicum Beach, B.C. At Little Star Children's Centre, childhood is celebrated and families are valued. We have a deep respect for nature, the environment, for ourselves, our friends and for our surroundings. We promote a lifelong love of learning; offering inspired, inclusive, and developmentally appropriate activities to nurture a child's physical, cognitive, emotional, social and spiritual (moral) growth. We believe that through play, children learn and grow. We are pleased to offer fun and creative daily yoga classes. Yoga fosters creativity, confidence and compassion while maintaining flexibility and strengthening the body. Yoga teaches kids to relax and is a tool for stress management. Not to mention, kids love it! Miss Tonya is a registered yoga instructor who specializes in childrens, youth and family yoga. The children learn through songs, stories and games. At Little Star we are proud to offer our educational circle in both english and french. Children will learn their numbers, days of the week and months through song. A variety of french vocabulary will be learned throughout the year through songs, stories and games. Practical Life: These exercises relate directly to daily living. ; they are everyday activities the children observe being carried out in the world around them. While learning self-care and social interaction skills, the children gain independence, competency, confidence and respect for their surroundings. By exploring and manipulating materials, they also develop fine motor control, which is essential for future coordination and development. Sensorial: These activities help children gain skills in organization, sequencing and spatial awareness. Children's senses are refined as they explore concepts of colour, shape, size, weight, volume, texture, taste, smell and sound. These skills are the building blocks for problem solving abilities, mathematics and later learning. Language: Storytelling, sound games and language arts activities enable children to learn the phonetic sounds of the English language. Phonetic and whole language learning is encouraged, and basic letter formation, comprehension, printing and reading skills will be taught as individual children become ready. French language is also introduced through games, stories and songs. Mathematics: Math concepts and materials involving counting, sequencing, patterning, organizing, building, measuring, comparing, and estimating are integrated throughout the children's day. Through math-specific activities, as well as usual routines such as block building, puzzles, play dough, rice, sand and water play, drawing, and movement, children develop the groundwork for mathematical thinking. Science, Botany and Zoology: Science is introduced to the children through conversation, observation, experimentation and exploration of ideas and materials. This area of the program will be guided by seasonal inspirations, as well as by the children's current interests. We will learn about our world and how to take care of it. Geography and Culture: Global peoples, families, multiculturalism and understanding, customs and traditions, foods, language, music, art, animals, land forms, deserts, the ocean, rivers, and outer space will be covered in this exciting and informative area of learning. The Nature Table: Throughout the year, we will have an ever-inspiring, ever-changing table of natural treasures. Children are encouraged to bring and share with their classmates, seasonal items that they have found. Examples include: small special stones, pinecones, nests, wild-bird eggshells, seashells, etc. Yoga: Yoga is practiced daily at Little Star, offering classes both in the morning and afternoon. Our classes offer an interactive way for children to get involved in yoga, through games, stories, movement and breathing. Art: Beauty is all around us. The children will have open access to a variety of art supplies and mediums. Each day will hold a special art activity to inspire creativity and self-expression. The artistic styles of celebrated artists from around the world will be introduced to the children, and they in turn will have opportunities to create their own masterpieces based upon their own interpretations. Music: Music is an integral component of our daily rhythm. 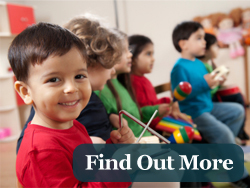 Children are musical creatures; making up their own songs, sounds and tempos to suit their moods and activities. Circle times are composed of songs, chants, and lyrical storytelling. Musical instruments will be available, and are used to enhance songs, teach rhythm, encourage listening skills, and promote a love of music. In addition, everyone is welcomed to sing joyously and spontaneously during our days together! Imaginative Play: Children's play is truly their work. Through their playing, they learn, explore, experiment, project, dream, problem solve, relate and prepare themselves to live in and with the world around them. Materials from nature, textures of fabric, dress up clothes, and interesting objects without logos or advertising are provided for fantasy play; props they can use to create scenarios as rich and as varied as the children who imagine them. Physical Activity: Daily physical activity, both indoors and out, provides opportunity for children to feel physically comfortable within their bodies, allows for the development of both fine and large motor skills and coordination, encourages healthy living habits, and contributes to a positive mind-body image. The children will have time each day for physical activity. We will run around outside on the grass, go for nature walks, tackle obstacle courses, participate in sports play, and enjoy a variety of dance styles and creative movement. Field Trips: We will enjoy several field trips each year. These will vary, depending on the interests of the children, the topic of learning, and the availability of community resources. We will often require volunteer drivers to make these trips possible, and parents are encouraged to accompany us on our adventures. Inclusion: Little Star welcomes all children, including those with unique learning needs and abilities. Modifications can be made in our classroom environment to accommodate special needs and extra staffing may be provided when needed. We believe that an inclusive curriculum enriches the learning experiences for all children, families and staff in our program. Pets: Interacting with animals provides children with wonderful learning opportunities. Children learn kindness, gentleness, compassion, empathy, a sense of responsibility for other living creatures, as well as growth of self-confidence and self-esteem when in a supervised classroom with an animal. Nutrition: Nutrition is important to a child's healthy development. At Little Star, we enjoy baking, cooking and juicing with our children. Juicing is scheduled once a week, and rotates days so each child will have a chance to participate. Snacks and Lunches: There will be a morning snack time, and lunch time, and an afternoon snack time. Families are asked to provide their own healthy snack choices. Full day classes are required to bring two snacks, plus a nutritious lunch. To reduce waste, please send lunches in labeled, reusable containers. Water will be available for the children to drink at all times. Due to potential allergy concerns, Little Star Children's Centre is a NUT-FREE FACILITY. Thank you for your cooperation on this serious health and safety matter. We promote healthy eating practices. Sugary snacks do affect the children's behaviour. Please DO NOT SEND JUNK FOOD: chocolate, sugary cookies, pudding, jello, fruit roll ups, candy fruit snacks, candies, etc. If sugar is listed as one of the first two ingredients on the packaging, the food is considered a sweet treat, and we will likely send the snack home with a kind note reminding of our healthy food policy. Examples of healthy food choices are: cut up fruits and veggies, cheese and crackers, hard boiled eggs, hummus and pita, cut up sandwiches, soup, rice or noodles in thermoses, sushi, wraps, leftover pasta or pizza, smoothies, yogurt, muffins, bagels, tortilla chips and salsa, rice cakes, raisins, dried fruit, pretzels, healthy granola bars, etc. There will be occasional class celebrations where we will encourage families to send in yummy snacks and treats for sharing. These include birthdays, Halloween, Christmas, Valentine's and Easter parties.... Healthy fruit and veggie treats, as well as Goodies such as cookies, cupcakes, and cake squares will be welcomed for these special events. DUE TO CHOKING CONCERNS, NO GUMMIES OR HARD CANDIES PLEASE. Quiet / Rest Time: Full day children will have a quiet rest time in the afternoon. Our centre can be a busy place, and this time allows your child the chance to relax and recharge. Children who are not in need of an afternoon nap will have the opportunity to read quietly or do quiet activities on their mats. Parents are required to send a special blanket (and stuffy) for their child. Please inform staff of your child's individual needs in this regard. Allergies: In order to provide safe and healthy care, it is essential that Little Star maintain a complete and up to date medical history of you child. Please fill out in detail the medical information section on your child's Registration Form, which will be kept on file. All allergies will be posted within the centre for quick reference Should your child's medical information change, please inform centre staff as quickly as possible to ensure the continuity of safe and healthy care. Little Star Children's Centre is a NUT-FREE Facility. Arriving, Departing and Parking: Little Star Children's Centre is accessible through the double doors located on the left side of the church, near the back. For security purposes, the doors will be locked at all times. Please knock, and centre staff will welcome you inside. PLEASE TURN OFF CAR ENGINES while dropping off picking up children. You may use the gravel parking lot off Sunningdale for drop off and pick up. Upon arrival and departure, please sign your child in/out with your initials on our sign-in/out sheet located by the parent's bulletin board. This is required by Licensing to ensure the safety of your child. If children are picked up late, they may feel a sense of abandonment. This is especially true if they are the last child left at the end of the day, and have seen all their friends leave before them. The children may then associate this feeling of abandonment with being in care. In order to provide a positive experience for your child, please arrive promptly for pick up. If you need to speak with staff, please understand that arrivals and departures are very energetic and high-traffic times for the centre. Staff will do their best to accommodate your concerns in a timely fashion. You are always welcome to arrange a meeting with either Shannon or Tonya for a time that is mutually convenient. LATE PICK-UP FEES: A CASH charge of $1 per minute will be applied to all late pick-ups that are not pre-arranged. This fee will be due before the child's next day in care. Receipts will NOT be issued for late fees. Please set your watch to our classroom clock to ensure consistency. If the designated person does not arrive in a timely manner (within 30 minutes) to pick up your child from care, efforts will be made by staff to contact an alternate pick-up, as listed on your registration forms. If staff are unable to find an alternate pick-up for your child, the Ministry of Children & Families will be contacted, and the child released into their care. This policy is mandated by Licensing, for the safety and security of your child. Attendance: Please notify the centre by 9:30am if your child is ill, will be absent, or if your family will be away for an extended period of time. This allows us to accordingly schedule our day. Thank you. Refunds are not given for missed days of care. Biting: Biting is a common developmental process in children. However, Ministry guidelines state that biting is a serious issue requiring careful attention. All bites will be recorded, and parents notified. Any bite that breaks the skin requires the writing of a critical incident report, and the immediate contact of both families, so that they may seek medical attention if desired. Biting that becomes a pattern will require an action plan to support the child, interrupt the biting pattern, and redirect behaviour into safer and more appropriate activities. Repeated, aggressive biting will result in the biter being sent home for the day, or dismissed from the program. In such a case, it is the parents' responsibility to ensure that alternate childcare is available. Birthdays: Birthdays are special and exciting times for children. Little Star will provide the Birthday Child with a special surprise on his / her important day. You are welcome to provide cupcakes or other small treats to share with the children. Please ask staff for numbers and be aware of any food allergies within the centre. Remember that Little Star is NUT FREE. NO gummy candies, please! Alternately, if, for personal reasons, you DO NOT wish your child's birthday to be celebrated during care, please inform staff. Thank you. Changes in Information: Please notify the centre immediately of any family changes. These include changes in contact information: phone numbers, addresses, place of employment, medical / allergy information, drop-off and pick-up information, family dynamics: an expected birth in the family, a death, divorce, stress, etc. No change is too small to mention, as your child's behaviour, health and safety may be affected by even the smallest difference. If there is a matter you would like to discuss privately, please notify Tonya or Shannon, and arrangements will be made for a mutually convenient meeting time. Custody Agreements: Legally, the centre cannot restrict a parent's access to a child. If your family has specific legal custody arrangements that you would like Little Star to honour, dated, court-written documentation MUST be provided. Such information will be kept on file, and is strictly confidential. Clothing: All children are required to bring a pair of slippers or clean inside shoes to wear at the centre. A full change of clothing — including socks and underwear — is also required daily. Please label all clothing, slippers and rest time blankets with your child's first and last names. Thank you. Playing and learning can sometimes be messy. Please dress your child in play-friendly clothing. As we plan to go outside every day, please ensure that your child's clothing and shoes are appropriate for the outside weather. Think layers! Send hats during sunny, hot weather; raincoats, muddy buddy pants, and boots during wet weather; and warm coats, mittens and toques during chilly weather. Please apply sunscreen to your child during warm, sunny weather. The children will be expected and encouraged to manipulate their own clothing as best they can. To help your child feel capable and confident, please dress your child in easy to put on / take off clothing. Elastic waistbands, snaps, zippers big buttons, and velcro are empowering and child-friendly. No lace, tie-up shoes or flip-flops please. Closures: Little Star Children's Centre will be closed for all statutory holidays. We will close for a Christmas break, a week Spring break (to be determined), and a Summer Break which will be the last week in August and will reopen after Labour Day. As our staff is busy year-round provinding quality care and education to your children, these closures and all Stats are included in your child's tuition. In these rare instances, we will either plan a field trip, or close for the day (in which case tuition for the day will be refunded.) We thank you in advance, and ask for your understanding and cooperation. Whenever possible, families will be notified in advance by classroom notice and/ or newsletter of any upcoming centre closures. Closure due to Power Outages: If the power at Little Star goes out, and remains out for an hour or more, parents will be notified to pick up their children from care. Refunds are not given for closures due to acts of nature. Closure due to Snow: In the event of closure due to a major snowfall, parents will be notified as quickly as possible. Each weather situation will be assessed individually. If QBES is closed due to snowfall, we will most likely close as well, to ensure everyone's safety. Parents are welcome to call Shannon (250) 686-4129 or Tonya (778) 350-1644 to confirm possible closures. Refunds are not given for closures due to acts of nature. Dismissal Policy: It is our desire to never dismiss a child from the centre. All efforts will be taken to avoid this measure: we strive to build a committed partnership between staff, families, and, when appropriate, extra community support. In the unfortunate event where it becomes apparent that Little Star is unable to meet the specific needs of a child and their family, any unused portion of paid fees will then be prorated and refunded. Emergency Procedures: As a VIHA licensed childcare centre, committed to the safety and well-being of the children entrusted to our care, Little Star will practice routine fire and emergency drills. The Emergency Evacuation Plan is posted within the centre. Little Star will also be routinely inspected for health, safety and developmentally appropriate practices by VIHA Community Care Facility Licensing Officers. Their reports will be posted within the centre as well. Families are welcome to review these at any time. EMERGENCY EVACUATION: If, due to an emergency, we are unable to safely remain in our centre (church building) we will re-locate to the QUALICUM BEACH CIVIC CENTRE. As mandated by VIHA Licensing, Little Star is equipped with emergency supplies to provide care for children (and staff) for up to 72 hours after an emergency. There will be an ANNUAL $10 CHARGE to maintain this supply. Funerals in the Church: Occasionally, there will be a funeral in the church upstairs. During these times, we will close. As much advance notice will be given as possible, and tuition for this day will be credited back to you. Thank you for your understanding and cooperation. Guidance Policy: Appropriate behaviour is modeled and encouraged by the staff at Little Star Children's Centre. Self-discipline is taught to the children by examples and supported through teaching. Positive reinforcement ("catching them being good") is a very powerful acknowledgement for children. Limits and expectations are stated positively. For example, "Inside we walk. Hands are for helping. Water stays inside the water table..." The physical environment of the centre is set up to promote the success of each child's abilities and management skills. All behaviour is a form of communication. When dealing with conflict situations, staff will gain the child's attention in a respectful way, address the child at his or her own level, face to face, acknowledge the child's individual feelings, and encourage the child to communicate his or her thoughts verbally. Appropriate choices will be given, and each child's integrity will be protected. When necessary, the child will be redirected to a more appropriate activity. Through respectful, gentle intervention and consistent staff support, the child's budding self control, verbal and social skills, and creative problem-solving skills will blossom. Natural and logical consequences are excellent teaching tools for empowering children to become capable, self-sufficient and confident. These will be used whenever appropriate and safe. In certain challenging situations, a child will be asked to take some quiet time to regain control. The child will be supervised and supported during these times. Violence, bullying, teasing and rude language are not acceptable behaviours for our centre. We understand that children of preschool age are learning the differences between acceptable behaviour, and behaviour that is socially undesirable or cruel. We are naturally a part of that learning curve. The key is to discern between mean-spiritedness, which is not acceptable, and awkward social skills, which require understanding, patience and supported education to allow all children to succeed socially and emotionally. Little Star Children's Centre supports the guidance and discipline philosophies as outlined in the Ministry booklet "Guiding Children's Behaviour." Illness Policy: Control of communicable illnesses amongst children in care is a primary health concern. We are very firm on our illness policy! It is absolutely crucial to the health, well-being and daily functioning of the entire centre! Refunds are not given for days missed due to illness. For the health, safety and comfort of all children in care, CHILDREN WHO ARE VISIBLY ILL MUST BE KEPT HOME. Diarrhea, vomiting or upset stomach. Discharge or drainage from eyes, nose, ears or open sores. Signs of a newly developing cold. Extremely tired or fussy behaviour, indicating the possible onset of illness. Any communicable disease as defined by the Ministry of Health Booklet. If you have any questions about whether or not your child should attend care, please call before bringing your child for the day. Children MUST be kept home from care until he or she has been symptom free for at least 24 hours. If centre staff assess upon entry that your child is sick & should not be in care, you will be asked to take your child home again. If your child should become ill while in care, a parent or emergency contact will be required to pick up the child so that he/she can recover at home with those they love best. It is the Parents' responsibility to ensure that alternate childcare is always available in case of such a situation. Immunizations: Please keep all immunization records current and up to date. Please inform centre staff when new immunizations are given so that staff can adjust your file accordingly. Children do not need to be immunized to attend Little Star. If you are not following the BC immunization schedule for your child, please state this on your Registration Form. Medications: Medication (including skin creams, lozenges, over the counter products and SUNSCREEN) will be administered to your child ONLY upon the receipt of a completed permission form, and ONLY if the medication is in its original container with the instructions clearly stated by a physician, (in the case of prescription medicine) or in the dosage indicated as appropriate on the container for non-prescription. Open Door Policy: Little Star Children's Centre strives to create a positive partnership with parents. Families are respected and appreciated as children's first teachers and one of the very most important influences of children's lives. Parents are invited to join us at any time to observe their children. We welcome families to share their talents and hobbies with the children. (For example: storytelling, singing, musical instruments, gardening, sewing, woodworking, pottery, painting, dance, etc) We also encourage parents to share their professional expertise with the children. (ie: police officer, firefighter, nurse, doctor, dentist, chef, librarian, etc.) This is especially exciting during our "Community Helpers" studies. We are excited to celebrate each child's cultural background, and invite families to share special days, foods, activities, clothing, etc. Please advise centre staff if you are able to come and share with us! Refund Policy: Little Star Children's Centre requires one month's written notice for the withdrawal of a child from the program. Failure to provide one month's written notice will result in the forfeit on one month's regular child-care fees. In the event that Little Star Children's Centre is unable to complete scheduled programming, any post-dated cheques held on file will be returned to the family, and all refunds will be pro-rated. NOTE: To maintain your child's space at Little Star, regular tuition payment is still expected in full, and tuition refunds are NOT given for missed days of care due to occasional childhood illnesses, family vacations or unexpected closures due to acts of nature. Due to our full enrollment schedule, missed days of care are not transferable to "make-up-days". Please consider monthly tuition fees as "rent" to hold a care space for your child. The child will ONLY be released to those individuals listed in their registration package. This information must be in written form. Verbal permission is not acceptable. Picture ID may be required. Please inform the person picking up of this condition, so that they can become comfortable with it. It is not meant for embarrassment or confusion; rather it is a safety precaution. If the picture ID does not match our written records, the child will not be released. You may add or delete the names on your filed pick up list at any time. Please ask centre staff to assist you with this. In cases of divided families and custody issues, a copy of all pertinent court orders relating to your child must be in your child's file at the centre for us to comply with them. Please remember that such files are strictly confidential, and essential for the safety and security of your child. For Little Star to legally restrict parental access, copies of current court documents are necessary. If your plans change unexpectedly, and someone who is on your list will be picking up your child, please call the centre to advise us, so that we may prepare your child for this unexpected change. Under NO circumstances will a child willingly be released to a person (including a parent / guardian) who appears to be incapable of providing the necessities of care to the child. (ie: intoxicated, incapacitated or violently abusive.) If this situation arises, the child will remain in our care, and the centre will attempt to contact an alternate authorized person to pick up the child. We may be required to inform the Ministry of Children and Families or call the RCMP in such a situation. If no one appears to pick up a child after a timely fashion, (within 30 minutes) centre staff will attempt to locate the alternate contacts on the registration form. If the listed individuals cannot be reached, the Ministry of Children and Families will be contacted, and the child will be released into their care. This is for the safety and security of your child. Toys: Please do not send toys to the centre. This will avoid anything getting lost or broken. Special items may be brought for show and tell during circle time, and then the children will be expected to keep these items safely in their backpacks. Stuffies may be sent for use at quiet time. Toilet Training: Children must be toilet trained to attend Little Star Children's Centre. Children must be in underwear, (NO pull-ups) and must be able to effectively communicate toileting needs to centre staff. We will empower and support the children's success in this area with reminders and regular bathroom breaks. Understandably, "accidents" happen, and staff will handle these situations delicately. Always send your child to care with a complete change of labeled clothing, including socks and underwear. Please advise centre staff of your child's individual needs in this matter. FEES ARE PAYABLE IN ADVANCE, BY A SET OF POST-DATED CHEQUES, to be kept on file at the centre, and cashed on the first of each month. Past 90 days: Court Action may be taken. Administration fees will apply. Money issues can be an intimidating and challenging area for caregivers to deal with. Please remember that Little Star Children's Centre will be providing exceptional care for your child. and that the emphasis for centre staff is on your child's education and enjoyment, not bill collection. Post-dated cheques kept on file ensure that child-care fees are always paid on time, eliminating the need for frustrating and time consuming bill collection. and thus enabling Little Star to maintain and provide uninterrupted consistency of learning materials, supplies, high-quality curriculum planning. and activities for your child. Please Note: Late or neglected tuition payments may result in the termination of your child's care space. Please speak with Tonya or Shannon if you have questions of concerns regarding tuition payments. There will be a $40 (cash) charge for any NSF cheques. Families on the Ministry Subsidy Program are asked to meet with Tonya or Shannon to determine the parent-portion of fees, payable in advance by post-dated cheques. It is the parents' responsibility to ensure that completed subsidy renewals are submitted to the Ministry ON TIME, to prevent the interruption of fee payments. If subsidy is not renewed. regular tuition fees will be charged. Failure to pay tuition may result in the termination of your child's care space. Tax receipts will be issued at the beginning of each month. Please keep these receipts safe, as there will be a $25 charge for the issue of duplicate receipts. Violence: We have a ZERO TOLERANCE policy for malicious violence. Each situation will be addressed individually and documented. Parents will be notified immediately. Children (or their family members) who act violently may be sent home. suspended from care, or asked to leave Little Star permanently. In Conclusion: Little Star Children's Centre strives to build open partnerships with families through honest. effective communication, up to date registration information, and creative, developmentally appropriate program planning. to facilitate the positive growth and education of the Whole Child: Heart. Head and Hands. Please feel free to contact Little Star at any time with your questions or concerns.